The “Chilling Adventures of Sabrina: A Midwinter’s Tale” will arrive next Friday. The special standalone installment was crafted specifically to bring you some cheer while you await the Kiernan Shipka-led series’ Part 2 launch in April. Actually, it was originally just created because “Sabrina” creator and showrunner Roberto Aguirre-Sacasa realized he hadn’t checked his Part 1 list twice in the holiday episode department. Then it all came down to Netflix — which launched “Chilling Adventures of Sabrina” Season 1 on Oct. 26 — wanting to bring fans even more of the teen witch’s tale as soon as possible, even though Part 2 is still in production. In the holiday-themed one-off, the Church of Night, like all covens, celebrates the Winter Solstice — the longest night of the year — when families gather around the Yule Fire to sing Pagan carols and tell ghost stories. But the holidays are also a time for guests and visitors — both welcome and unwelcome — so you never know what might come down the chimney. 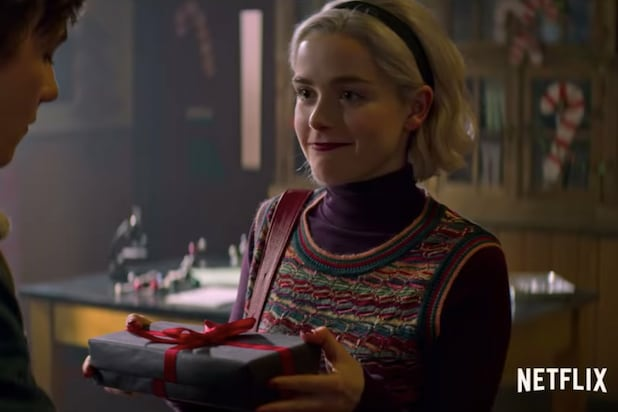 The streamer released a trailer for the holiday episode Tuesday and a teaser for “Chilling Adventures of Sabrina” Part 2 a few days before that, revealing that installment will launch in April. 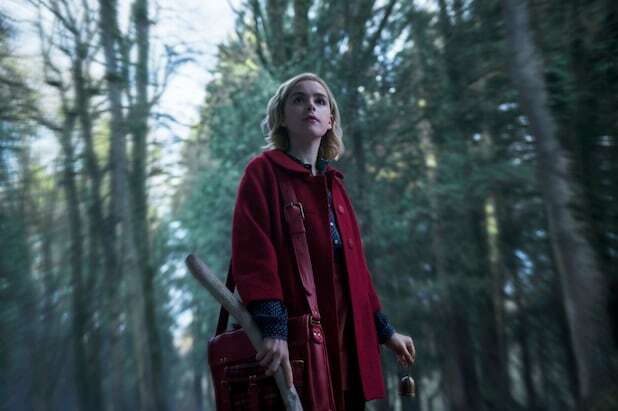 Even though “Sabrina” got a two-season order from Netflix right off the bat, that spring premiere date is much earlier than most fans were expecting the next batch of episodes to be released. But it doesn’t seem like a crazy idea, given how popular the show is — and because the showrunner says they’ve almost finished shooting those upcoming stories. Aguirre-Sacasa — who also created and showruns The CW’s “Riverdale” (another dark Archie Comics adaptation) — says he’s not concerned with the episode switch messing with the flow when “Chilling Adventures of Sabrina” returns next spring. Check back with TheWrap after the holiday episode drops for more spoiler-heavy content from our interview with Roberto. “Chilling Adventures of Sabrina: A Midwinter’s Tale” launches Dec. 14 on Netflix.